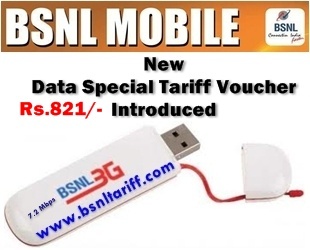 After rationalization of Data and Voice Special Tariff Vouchers, Most Trusted Telecom Brand Bharat Sanchar Nigam Limited (BSNL) has introduced new Data Special Tariff Voucher under both 2G and 3G Prepaid Mobile Services. Data Special Tariff Voucher of Rs.821/- offers, 7GB Free Bundled Data Usage with validity for 60 days and after Free Data usage 2ps/10KB will be charged. The above Data Special Tariff Voucher can be activated either from Easy Recharge or by sending SMS code as DATA821 to 53733. The above STV will be implemented and with effect from 16-09-2013.